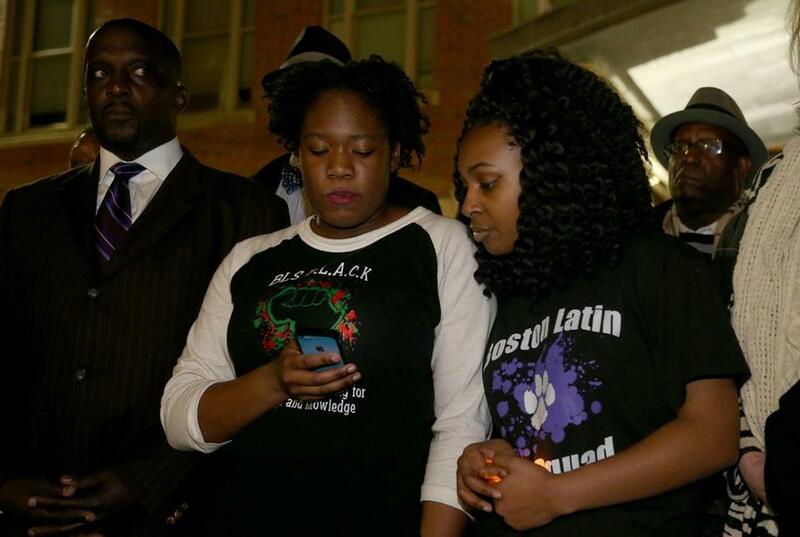 Boston Latin students Meggie Noel (left) and Kylie Webster-Cazeau read a statement Saturday. One by one, students at Boston Latin School stepped on to the stage in their school auditorium and recited a poem written about their experiences with racism. “I am an angry black BLS student. . . . A white classmate was shocked that I could get accepted and she got rejected,” one female student said in an even tone. “Teachers underestimate my ability to do well in class,” another female student said. More than a dozen students participated in the presentation held Saturday night as part of the Black History Month Showcase that drew at least 100 students, parents, and alumni. Earlier in the day, Mayor Martin J. Walsh met with community leaders at the school to discuss allegations of racism at the prestigious public high school. A civil rights group on Friday formally asked US Attorney Carmen M. Ortiz to investigate. Lynne Mooney Teta said she will work to improve the school’s racial climate amid a controversy that prompted calls for her to resign. Darnell Williams, president of the Urban League of Eastern Massachusetts, attended the meeting with the mayor. “It’s really refreshing to come forward with a sense of collaboration,” Williams said in an interview Saturday. Bonnie McGilpin, a spokeswoman for Walsh, said the mayor would not comment on the meeting. “The mayor is fully committed to launching an independent review and is currently seeking input from the community before detailing next steps. His main focus continues to be ensuring we are fostering a safe and supportive environment for all BLS students,” McGilpin said. The controversy has rocked BLS and its network of alumni. After Saturday’s showcase, student representatives of BLS BLACK — which stands for Black Leaders Aspiring for Change and Knowledge — read a statement, calling on school alumni and others to work for change at the school. Alumni who attended Saturday night saluted the students’ call to action. “I’m really impressed and floored by the young organizers,” said Laura Soul Brown, a black woman who graduated in 1978. Alexandra Koktsidis can be reached at alexandra. koktsidis@globe.com. Follow her on Twitter @akoktsidis.